Burger King's Breakfast Muffin bears a strong resemblance to its competitor. (CNN) -- If imitation is the sincerest form of flattery, then fast food giant Burger King is paying its longtime industry rival a royal compliment. In a new television commercial, Burger King's mascot, a slightly sinister king with an outsized, motionless plastic head, breaks into the headquarters of McDonald's and steals the recipe to their Sausage McMuffin with egg and cheese. The advertisement is a parody of super agent derring-do, with high-tech gadgets and a swift getaway. But it's also a sly wink at Burger King's new BK Breakfast Muffin Sandwich's undeniable resemblance to the classic Sausage McMuffin. But are McDonald's executives upset with this campaign? Have lawyers been rallied and accusatory calls been made? "We haven't received any direct feedback from competitors," said Brian Gries, Burger King's vice president of marketing impact. Gries further defends his company's choice to be up-front about the similarities between the BK Breakfast Muffin and the McMuffin, saying, "We are not above taking a product that we know customers like and delivering it to our guests at a great price." In fact, many others in the fast food arena aren't averse to this, either. 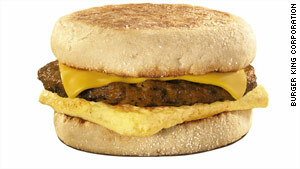 For instance, both the BK Breakfast Muffin and the Egg McMuffin are part of special breakfast "dollar menus." But, as Gries points out, "we were the first to launch a national breakfast value menu, and now you see that becoming an industry norm." But it's a "norm" that is rarely acknowledged. When asked about Burger King's campaign admitting to "stealing" the Sausage McMuffin, a McDonald's representative said, "We remain focused on our business and serving our business." The proof, however, is on the record. Even if Burger King hadn't publicly admitted "burglarizing" McDonald's, the McMuffin arrived to market first. The original Egg McMuffin was conceived in 1972. Fortunately for competitors, McDonald's doesn't own the rights to eggs, sausage, cheese or English muffins. Just the powerful brand-name "McMuffin." But even "the House That Ronald Built" isn't above finding inspiration in the products of other fast food innovators. In 2008, McDonald's faced criticism for launching its Southern-Style Chicken Sandwich, which featured a fried chicken cutlet on a buttered bun with two pickles. To fast food connoisseurs, it appeared nearly identical to the chicken sandwich that made Georgia-based Chik-fil-A famous. These allegations were disputed by McDonald's. And this isn't the first time Burger King has created a product that mirrored its longtime rival. The Big Mac is McDonald's signature burger: two all-beef patties, special sauce, lettuce, cheese, pickles, onions, served on a sesame seed bun. But in 1997, Burger King released the Big King, which was two all-beef patties, special sauce, lettuce, cheese, pickles, onions, served on a sesame seed bun. The difference between the Big Mac and the Big King? It wasn't the "special sauce," a variation on Thousand Island dressing. It was the beef patties: Burger King "flame-broils," but McDonald's "grill fries." The Big King was discontinued in 2003.